When it comes to leading the hit parade, Nashville’s Austin Watson certainly knows a thing or two…or 58. It would be understandable if the player who wears No. 51 on the Predators might be a little tired after two rounds of dishing out body check after body check on a nightly basis – 58 of them in the 2017 Stanley Cup Playoff race. But as Watson sees it, the more hits he delivers, the more effective and energized he is. Welcome to the crash and bang world of Nashville’s blue-collar forward. “If someone said that I played a good playoff game, I probably would have had 5-6 hits,” Watson told NHLPA.com. But it isn’t all about making a mark – or leaving a mark – against a rival. Averaging a shade below 14 minutes per game, the Ann Arbor, Michigan native has also made his presence known in other ways. Blocking shots, getting under the opposition’s skin – Watson does it all with a big smile on his face. It’s proven to be a winning formula for Watson. Drafted 18th overall by the Predators seven years ago, the forward helped Windsor hoist the J. Ross Robertson Cup (Ontario Hockey League playoff champions) and Memorial Cup (Canadian Hockey League championship) in 2009. Watson played on the Spitfires with current Predators teammate Ryan Ellis. Three years later, Watson was part of a London Knights squad that won the Robertson Cup. He received the Wayne Gretzky 99 Award as the OHL Playoff MVP in 2012. Other recipients include Corey Perry, Marc Staal, Bo Horvat, Connor McDavid and Mitch Marner. Internationally, Watson led the United States in points and assists at the 2012 World Junior Championship, and helped Team USA win gold at the 2010 U-18 World Championship. 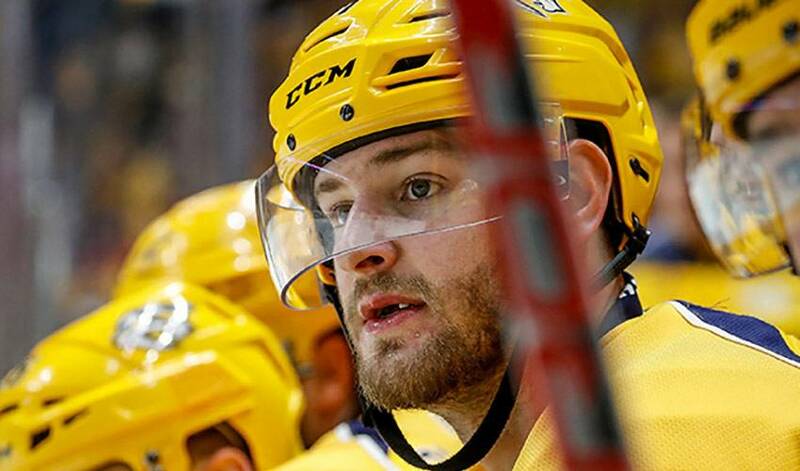 These days, he’s making the most of every minute with an upstart Nashville group looking to land the franchise its first Stanley Cup championship. Recalled from Milwaukee of the American Hockey League on October 22, the 6-foot-4, 204-pounder contributed five goals and 17 points in 77 regular season games in 2016-17. And whenever the Predators have needed a physical boost in the playoffs, often it’s been Watson leading the way. The oldest of 10 children has also chipped offensively. Watson assisted on Vernon Fiddler’s winning tally in Game 1 of Nashville’s Western Conference semifinal series against St. Louis. He’ll be looking to do more of the same when the Predators take on the Anaheim Ducks with a trip to the Stanley Cup Final on the line. Not bad for a former Red Wings fan that hoped one day he’d get his shot at winning hockey’s biggest team trophy. But even more exciting to be in a position to experience it himself.